B Pennants began their season at the Grange against Shoalhaven Heads. Missing two of our players to injury (Arthur and Rob) and Ken Bradley – holidaying in Tassie. It was going to be a challenge. Our thanks to Tim Young who stepped up and played at 5. In a close encounter Tim went down 2/1. We appreciated his efforts. Ray Orr playing at 4 scored a tenacious 1up win. Grinding down his opponent as only Ray can. Playing at 3 JP came up against a red hot opponent who hit every fairway on his way to a 7/6 loss. Pete Munro playing at 2 was obviously in a hurry. Being 6 up after 6 holes he tore the heart out of his opponent who had won the Heads monthly medal the day before. TP played at 1 and in a close match it came down to putting. With The Heads opponent not missing anything under 2.5 m, TP went down 4/3. So a 3-2 loss but it’s a long season and anything can happen. With pride and determination the C Pennant Corellas started their season against Gerringong and in a close encounter drew their match 2.5 each. First out was Tom Zimmermann fresh from daily massages at Port Macquarie. Tom was a little rusty and trailed early in his match only to make a late rally but ultimately was beaten on the 16th green 3/2. Boyd Sylvester, under the guidance of super caddy Bob Wright, followed up his impressive Saturday form to record a solid 3/1 victory. John Anthony, after a hiatus of several years, was in sensational form around the greens breaking the heart of his Gerringong opponent in a high quality match. 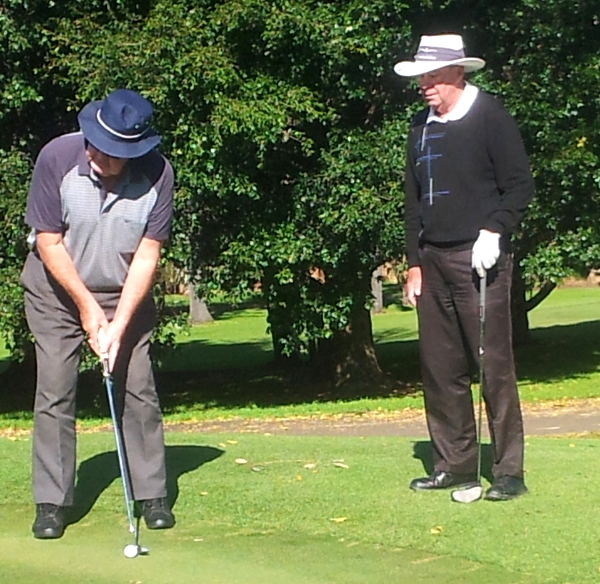 No putt or chip seemed beyond John as he continually holed them. John eventually took out the match 3/1. With the match locked at 2 -1 playing our two most experienced players at the end seemed like a good decision. Wayne Griffiths was two down at halfway and just could not make any inroads against his determined opponent despite playing many excellent holes. Eventually going down 2/1. This left Chris Leckey as our last hope. Chris trailed for most of the game but as the pressure mounted Chris’ game reached new levels and after winning the 16th and 17th holes he took the lead for the first time. By the time he reached the 18th tee a strong nor-easterly wind had blown in making the very tough 18th play even harder with the water short and right a major concern. Chris succumbed with his first shot hit straight at the heart of the green only peeling off at the last minute to find a watery grave. An excellent shot by his opponent followed and the match ended all square. A solid start to our season following our team mantra, ‘never give up, never surrender’. Wayne Arnott playing his first White Horse Cup game for the club played very well and in a close match lost the 18th to lose 2 down. Geoff Wilson was never troubled and played very well to win 4/3. Larry Kent match was very close with both players unable to gain more than a one hole advantage as the lead see-sawed. With three holes to go Larry trailed by one but managed to win the 16th, claim a half on the 17th and take out the 18th for a 1 up win. Peter Young was always behind in his match against a big hitting opponent and was always playing catchup golf. He went down 5/4. Don Thompson lost 4/2 with his opponent having all the answers to the questions Don posed. Phil Gosling played quite well as did his opponent and in a very close contest nobody could separate them in the end with the match finishing all square. We went down 3.5 to 2.5 but should not be disheartened. It was a very close match and could have easily gone our way with a few breaks. Let’s hope for a better result next match. Confusion reigned initially prior to battle at Bowral, as our opponents were allocated the same battle armour as Jamberoo. Obi Wan came out of the swamp and set the scene with a 210 metre arrow drive and his opponent was wandering helpless up in the trees. Ironically all our drives ended up in the same position on the First Hole. The Force was responding and had awoken. Q-G-Jinn, SL1, Skywalker, R2D2, and the ultimate Bounty Hunter on a Golf Course, Jango, all proceeded to the second hole knowing the storm-troopers were looking for an early exit. R2D2’s lightsabre was frustrating his opponent especially from 10 meters and Skywalker was hypnotizing the opposition with his sensitive chipping. Q-G-Jinn maintained relentless pressure forcing his opponent to change to Srixon Soft Balls, Jango toyed with his opponent wishing he had joined Jamberoo instead of the Heads. Obi Wan needed no imperial substance to achieve an outstanding victory. The Jedi Masters brought together from the various Galaxies around Jamberoo espoused the philosophy of ‘feel, don’t think – use your instincts’, created an impressive 6-0 victory. Six more battles using the same philosophy will retain the Force and ongoing victory. Congratulations gents a great return to form in B pennants of Pete Munro after his clearing the cobwebs the day before.. And Ray..just like a good racehorse…shows true form after a couple of starts back from a spell ..Well done boys …great effort by all teams representing the club..especially Cowpats…great effort..